A new song specially commissioned by Orkney Islands Council will help mark the historic Torch Relay visit to the county. The new piece marking the London 2012 Olympic Torch Relay visit to Orkney will be unveiled during a special public concert on June 10 at the Picky Centre. 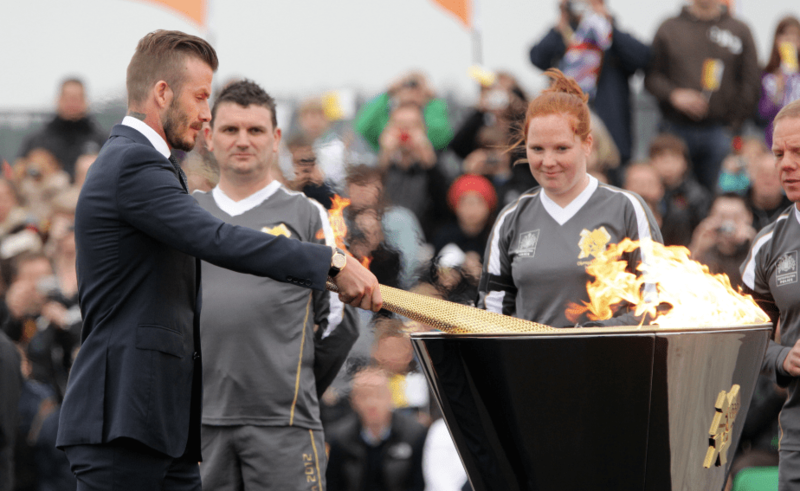 David Beckham during the ceremony to mark the arrival of the Olympic flame, at RNAS Culdrose, Cornwall. The song has been developed by well-known local musicians Brian Cromarty and Douglas Montgomery in conjunction with pupils from the county, and will be performed with a large choir from Papdale Primary School, along with various members of young bands No Soond, Girlband and Broken Strings at the free public concert following the relay in Kirkwall. Funding for the song – and for the public concert where it will be performed – came from Creative Scotland as part of their ‘Summer of Song’ programme linked to the Olympic Torch relay. “I’m really pleased with how it has come together,” says Brian. “The brief was to reflect the Olympic ideals of unity, peace and friendship, with a flavour of Orkney. “We had input from KGS Higher English students in the beginning, who contributed various themes and ideas which were invaluable in the development of the lyrics. Douglas Montgomery said: “Everyone who has been working on this project is just so excited – to be introducing a great new song about Orkney to our community is a great privilege. The song will be played in public for the first time at the special open air concert as the torch arrives at the Picky Centre to light the cauldron. The performers will be joined on stage by all the Orkney torchbearers. Acts will be introduced by local celebrity Cameron Stout. The event kicks off at the Picky Centre at 10am on June 10, after the completion of the relay in Orkney, and is expected to run for around an hour. Janice Annal, Chair of the Council’s Chair of Education, Leisure and Housing Committee, said: “I’m pleased that we’ve been able to pull this project together. ¸ There will be no public parking at the Pickaquoy Centre during the event with the exception of some disabled parking spaces.